SYDNEY, May 19, 2017 - (ACN Newswire) - Faecal Microbiota Transplantation (FMT) leader Professor Thomas Borody (MD, PhD) has called for a national faecal bank to fight drug resistant and epidemic diseases in hospitals and clinics across the country. Professor Borody, the Founder and Medical Director of the Centre for Digestive Diseases (CDD) in Sydney was the first in Australia to perform FMT, and he set up the world's first faecal bank in 1988. Since then CDD has carried out more than 12,000 FMT's and he has trained physicians from around the world in FMT techniques. Now many countries have their own national FMT banks, including several in the US and two in Asia. "It's time Australia had a national FMT Bank that rapidly provided hospitals and clinics around the country with a high quality, safe, uniform enema product for FMT treatment that will save lives," Prof. Borody said. Fewer than five hospitals in Australia carry out FMT which means thousands of people are missing out on proven FMT procedures, when at times the only alternative is radical bowel surgery. "FMT is rapidly becoming the standard practice of care for a range of drug resistant or relapsing diseases including Clostridium difficile infection and Ulcerative Colitis, and research in FMT for Irritable Bowel Syndrome (IBS) is continuing. Some of these conditions can ruin lives and may be fatal." Prof. Borody initiated a randomized clinical trial in Australia, the results published in the Lancet earlier this year, "The FOCUS study, on effectively treating Ulcerative Colitis using repeated FMT", http://bit.ly/2pY01Gn. This trial was in part funded by Prof Borody's CDD Research Fund, Broad Medical Research Program, Mount Sinai SUCCESS fund, and the National Health and Medical Research Foundation among others. Prof. Borody continued, "As more research is done on modern epidemics like Autism, Dementia, obesity, MS and Parkinson's disease, FMT is likely to play a significant role in managing and possibly even curing these conditions." Most recently Prof. Borody was involved in an Autism study in the US, in which 18 ASD-diagnosed children were treated using FMT. The Trial not only demonstrated progressive improvement in gastrointestinal symptoms commonly present in children with Autism, but also reported significant cognitive improvements beginning in some at five weeks an onwards. The Autism study was published in January of this year in Microbiome, entitled 'Microbiota Transfer Therapy alters gut ecosystem and improves gastrointestinal and autism symptoms: an open-label study', http://bit.ly/2pY01Gn. The Australian FMT Bank would require approximately AUD$250K to set up a simple, single unit with an ongoing maintenance fund to run the Bank. Later, a network of centres and donors to supply steady and reliable FMT material for each state would be required. Ideally it would be federally funded, as it would save the health system millions of dollars per year. However, private support is also an option said Prof. Borody, stating that he would be keen to contribute, given his experience in carrying out 12,000+ FMTs at the state-of-the-art CDD facility in Sydney since 1988. "At the CDD we already have patients coming in from around the world for FMT treatment. This is a great opportunity for Australian hospitals, with the support of a national FMT Bank, to become world-class FMT providers." The human bowel contains a complex population of bacteria known as the gut microbiota. These organisms and the chemicals they produce can affect the bowel and the body as a whole, and these effects can have both positive and negative impacts on a person's health. The human gut microbiota protects us from pathogenic or 'bad' bacteria. FMT involves the infusion of healthy human donor faecal bacteria via colonoscope or enema into a bowel that contains abnormal bacteria that are making the bowel 'sick'. This infusion process can be a single infusion or it can be repeated over a period of time, depending on the severity of the patient's condition. The use of healthy human flora appears to be the most complete probiotic treatment available today, capable of eradicating 'bad' bacteria and spores and supplying 'good' bacteria for recolonisation of the gut in certain conditions. Prof. Thomas Borody is the Founder and Medical Director of CDD. His keen interest in medical research led to the establishment of the Centre to provide both diagnostic procedures and effective treatments. Prof. Borody has published over 250 articles and abstracts. His knowledge and expertise has been sought after by patients from around the world. He is a reviewer for numerous medical journals and has developed novel therapies in gastrointestinal areas such as Inflammatory Bowel Disease, Irritable Bowel Syndrome, Parasite infestation, ulcer disease and resistant Helicobacter pylori and C. difficile. Prof. Borody continues to conduct research in order to improve current therapies and develop new treatments. To learn more, please see www.cdd.com.au. Professor Borody, the founder and Medical Director of the Centre for Digestive Diseases (CDD) in Sydney set up the world's first faecal bank in 1988. 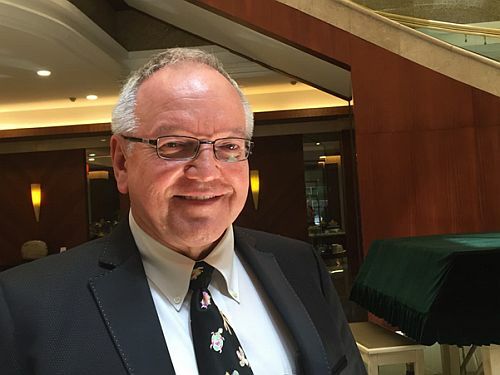 Professor Borody, the founder and Medical Director of the Centre for Digestive Diseases (CDD) in Sydney set up the world's first faecal bank in 1988 in surgery at the CDD.